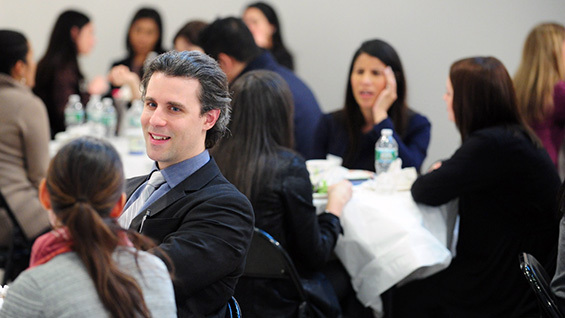 Over the winter break The Cooper Union's Center for Career Development hosted a conference of local college career development professionals, a first for the institution. 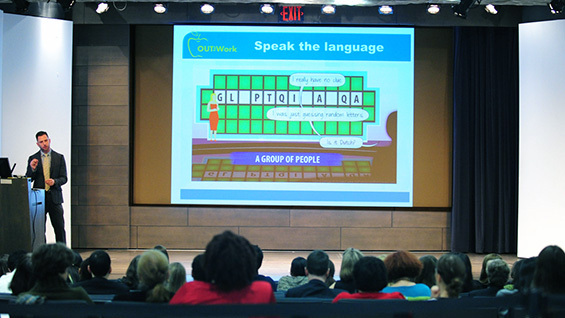 The quarterly meeting of the Metropolitan New York City Career Planning Officer's Association (MNYCCPOA) was held in the Rose Auditorium and highlighted the professional needs of "distinctive populations." The conference consisted of a half-day's worth of panels and presentations on how best to work with individuals with backgrounds that may require unique considerations, for example, a member of the LGBT community, or a military veteran, or an artist. The subject of the conference, "Polishing the Basics - Résumé Writing for Distinctive Populations," struck a chord with Robert Thill, Director of the Center for Career Development at The Cooper Union, who volunteered to host the conference. "I thought theme of the conference aligned nicely with Cooper's ideals and the Center for Career Development's mission," he says. "The Cooper Union has a strong history of supporting progressive social and cultural issues that are inclusive of distinctive populations and we have a deep interest in supporting the professional lives of artists." About 80 career development professionals attended the conference from a variety of the more than 60 colleges and universities that make up MNYCCPOA. Riley Folds, author of Your Queer Career, gave the keynote presentation. Bernadette Ann Fackovec, a specialist in working with military veterans, also spoke. Robert Thill participated in a panel discussion focusing on artists' résumés. Mixing in a bit of art history, he offered his expertise on unique resources for artists and the ways their résumés differ from those of other professionals. "The conference was eye-opening," says Jolie Woodson, Assistant Director of the Center for Career Development. "The presenters all passionately shared their expertise and illustrated the nuances of delivering quality career counseling and professional development resources that validate and respect students’ complex identities." "Everyone was engaged and I think they learned a great deal about how a résumé represents accomplishments that give expression to both personal and professional identities," Robert Thill says. "The conference gave career development professionals a chance to enhance our knowledge and to shed light on our own potential biases in working with specific populations so that we can better help students and alumni to succeed in their professional lives on their own terms." To find out more about the Center for Career Development's program and resources, read their annual report.